When a job seeker tells me, “I am open…” when I ask what type of job they are looking for, I roll my eyes. The job seeker is lying when they give me that answer. If you are a $197,000 Marketing Director in your last job, you are probably not going to take a $35,000 Marketing Assistant Job, right? And you know you may not be qualified for a $400,000 Chief Marketing Officer job, as much as you would love to eventually have this type of job. So, no, you are not open… That’s false. This “I am open…” answer tells me you are wishy-washy and don’t stand up for what you want. It tells me that you are getting desperate and think by saying “I am open…” you will have floods of opportunity come at you - with nothing mistakenly ruled out by having to be specific. Specificity gets interviews… A broad reach keeps you stuck in your crappy job or soul crushing unemployment. Broad resumes do not receive interviews when it tries to be all things to every employer. When someone has a broad resume, a resume without a target title or any specificity as to what type of job they seek, I start by asking, “What type of job do you want?” When the person cannot answer me in a simple elevator-pitch-type answer, then it makes it hard for me to help them. I don’t know where to start. I don’t know if they want to change careers, change industries, make a lateral move, land a promotion, stay performing the same function or if they are in an exploratory phase as to what may be next for them. I still need to ask a series of “career coaching” type questions to get to what they want to do and don’t want to do—and when I eventually get to that answer, it becomes clear they were not “open to anything” by the simple fact they were able to get specific with me. On the other hand, when someone answers with a career change, industry change but stay doing the same function, lateral move, promotion only or if they are in an exploratory phase to figure out what is next, I can help. I can offer suggestions of openings, even if they are a little off the specific path they just cited. Any of these answers start on the path of specificity and I have a chance to be helpful as a recruiter. But when I am given an aimless “I am open” answer, I cannot wrap my head around it to start offering solutions. So I don’t try and I often pass on the broad resume—because it is evidence the person is not standing up for themselves. Broad resumes are dishonest. And I ain’t got time for that nonsense as a recruiter. Recruiters don’t have time to navigate the untruthfulness and figure out what you want. Their job is to find talent that WANTS their job not be your career coach. So how can you be specific on your resume when you don’t know what you want? Or more importantly, how can you be specific on your resume and ensure you don’t miss out on any relevant opportunity that may have a different title? Well, attend my No-Cost "How to Design a Powerful Resume to Land 6-Figure Interviews & Get the Offer!" masterclass training session on Tues. 4/16 or Thurs. 4/18 at 1:30 p.m. ET and I will show you examples on how to do this. Resume examples that depict how to be specific on what you want. Tactics to employ to be clear with recruiters how your skills will benefit them. 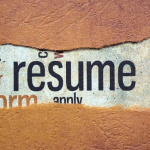 Formats of resume bullets to demonstrate how you have succeeded doing the relevant skills for the target job. Don’t wallow in a pool of meaningless broadness anymore. Stop trying to be all things to all people in your resume. Stand up for what you want and get it! See you there… Be well!